Have you ever needed someone to help you resolve a tech challenge and you just didn’t know who to ask? You’ve found him! Clients rely on Your Tech Concierge™ to help them get answers to their most difficult tech problems. 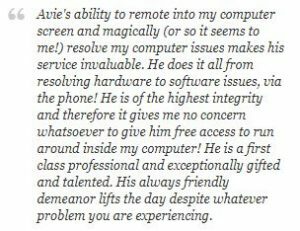 Helping people all over the globe discover and use technology to improve their lives is one of Avie’s greatest joys. He has combined his 30+ years of industry experience with the award winning products and services of his affiliates to achieve an unmatched personal level of service. Please tell a friend that you’ve found a great place to get help from a “geek” that can finally speak your language. Give me your Biggest Tech Headache – I will Relieve It or Your Consult is FREE! Helping people all over the globe discover and use technology to improve their lives through an unmatched personal level of service and expertise. To assist as many people as possible achieve their goals by being their supportive go-to-guy and helping them cope with the latest technology. “Room Service – It’s Remotely Possible”. A technology pioneer with business savvy who blends the ingenuity and creativity of a musician with the wisdom of an experienced troubleshooter. He is an energetic spirit with a nurturing helpful hand that provides a positive impact on every challenge he faces. He carefully utilizes his innate listening skills to understand any given challenge and systematically and often via remote access provides Global Technical “Room Service” to fulfill the needs of his clientele.